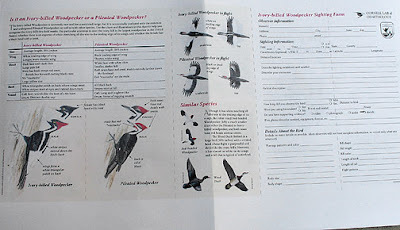 The back of the form had diagrams showing how to tell an Ivory-billed Woodpecker from a Pileated Woodpecker. The form was to be sent to Cornell. 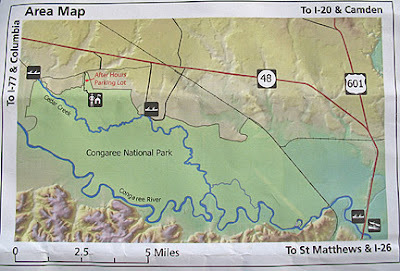 We walked the Bluff Trail, then the Sim's Trail to Wise Lake on Cedar Creek (blue line). 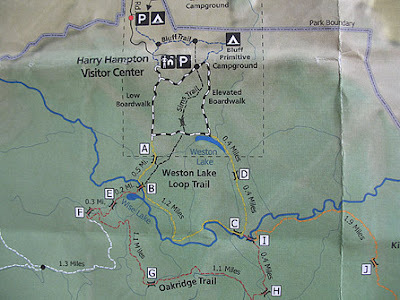 We could not get all the way down to the river (large lower blue line on upper map) because of flooding of the trails. The height of some of the trees were amazing. Lillian focusing on a bird high up. 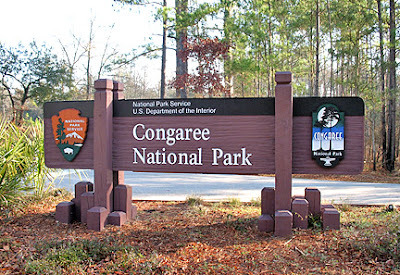 On our way to FL, we stopped in Congaree National Park (est. 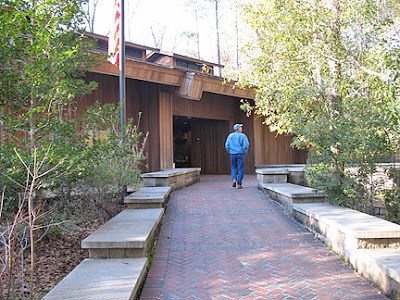 2003), South Carolina, a 22,200 acre preserve which contains the largest contiguous area of old-growth bottomland hardwood forest remaining in the United States and is one of the tallest broad-leaved forests in the world with thousands of trees over 130 ft. tall. Many of the trees are 100-200 years old. 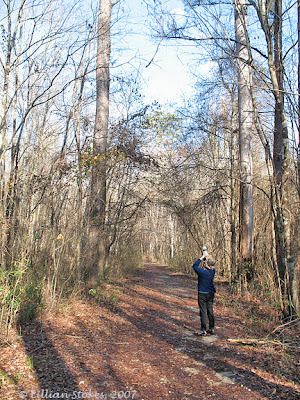 Bald Cyress and Water Tupelo trees are found in the low areas of standing water and Sweet Gums, Ash, Oaks, Loblolly Pine and other hardwoods grow in the rest of the forest. 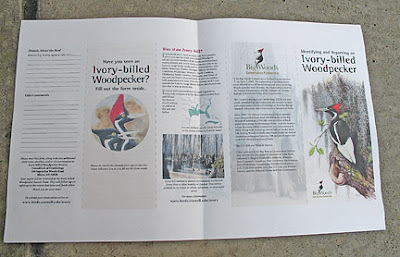 We heard there is a current Ivory-billed Woodpecker mobile search team associated with Cornell Lab of Ornithology that will be in the park from Dec. 5 th into Jan. searching and using autonomous recording units (ARUs). 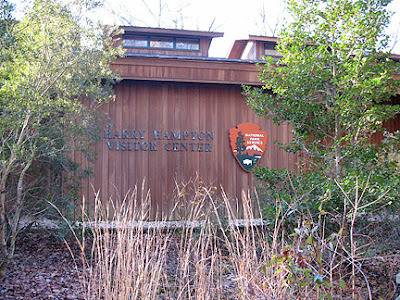 The Nature Conservancy, in cooperation with others in the South Carolina Ivory-billed Working Group will continue the search during the winter. Since we were passing nearby, we though we would stop and see for ourselves what this magnificent habitat was like. Visitors to the park may not use motororized vehicles or motorboats, but walking and canoeing are permitted. The park is vast and much of it is difficult to access. At the time we were there, much of the forest and trails that led to the river were flooded. We had limited time and walked the Bluff Trail then took Sim's Trail down to West Lake. There is a boardwalk but some of it was underwater. It was partly sunny and pleasant and ranged from the low 40's to the mid 50's. 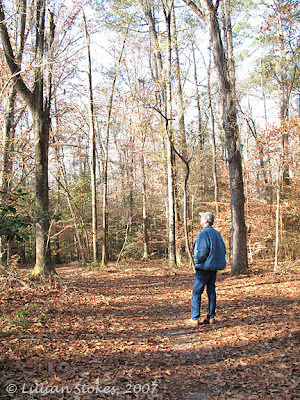 The forest was beautiful with the acoustical quality of deep quiet punctuated with frequent bird sounds, especially the ringing of Carolina Wren song and the bubbling cascade of Winter Wrens. 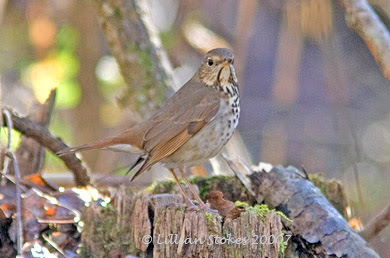 Early on we saw a Hermit Thrush, one of many we were to encounter. 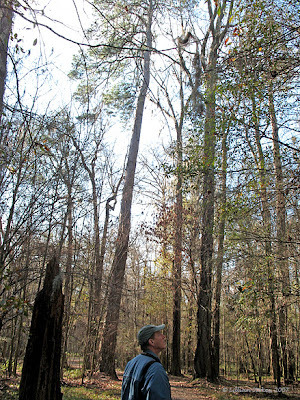 We were immediately struck by how tall some of the trees were. We had to cran our necks to see all the way to the tops. The large trees were mixed in with smaller trees and low vegetation without a very thick understory. It was as if we had walked back in time and were experiencing what it was like long ago. 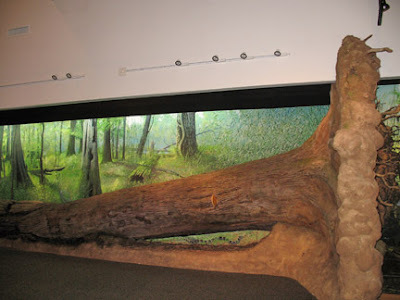 Up until the last half of the 1800's there were more than 52 million acres of floodplain forest in the Southeast. South Carolina had 1 million acres. Now there is so little left — what a loss.